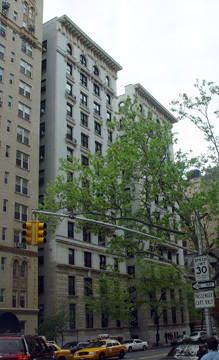 On a boulevard like West End Avenue or Park Avenue where most buildings are quite similar in size and configuration, it is often hard to stand out. 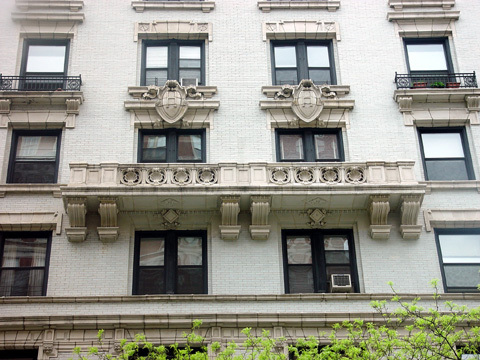 Sometimes a building can make itself more visible by having a very large cornice, such as can be found on the Astor Court apartment building on Broadway at 89th Street. Sometimes it can have a very large marquee like that at 960 Fifth Avenue. Sometimes it can have a marvelous rooftop watertank enclosure like that at 40 Fifth Avenue, or illuminated beacons like those atop the San Remo on Central Park West at 74th Street. Sidewalk building lanterns are another way to distinguish a building. The best in the city are found on the Sherry-Netherlands Hotel on Fifth Avenue at 59th Street where winged dragons have them hanging from their mouths. 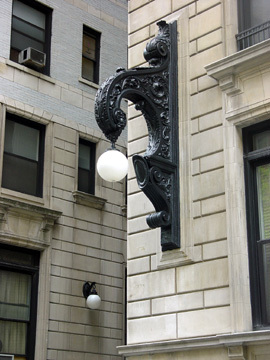 This building at 645 West End Avenue on the southwest corner at 92nd Street has the second best such lights. The lights themselves are simple, just large globes, but their hanging devices are enormous upside-down, wrought-iron hook-shaped projections that are both ominous and mysterious and very grand. Something of great portent must be transpiring here, they proclaim. Such flamboyant, eccentric gestures are the wonderful surprises of the city. While some observers view West End Avenue as quite demure and sedate, albeit attractive and dignified, it is, in fact, full of delightful and unusual architectural touches, especially in this area: witness the large green shields atop 600 West End Avenue at 89th Street, the fearsome but exotic fence around 610 West End Avenue at 90th Street and the bold masonry cross-hatching atop 680 West End Avenue at 93rd Street. This building was erected in 1912 and converted to a cooperative in 1983. 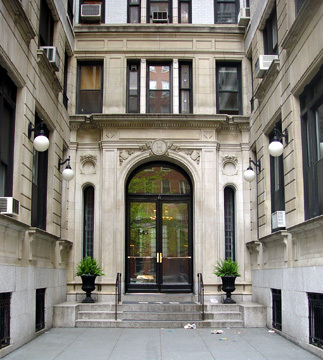 Its four-step-up entrance is recessed in a deep lightwell and has a large arch surmounted by the letter "H" incised in stone above the doors, which are flanked by tall, narrow, arched stained-glass windows. The large lobby also has stained-glass ornamentation. The entrance does not have a canopy, but perhaps once did as it would have lessened the bold impact of the hanging globes at the front of the lightwell. The building has a two-story rusticated limestone base over a half-story granite base. The top floor has arched windows and the building has a concierge and permits protruding air-conditioners. The building has no garage, no roofdeck and no health club and is several blocks away from a subway.